MoneySavingExpert.com today provides evidence Halifax and Lloyds TSB advertised pet insurance policies promising "life-long" cover before axing the products over recent months, meaning they were anything but life-long. The result of the insurance cull is many owners are unable to fully insure their pets now, which could leave some facing the choice between paying expensive vet bills or feeding their family, which could put their cat's or dog's life at risk. 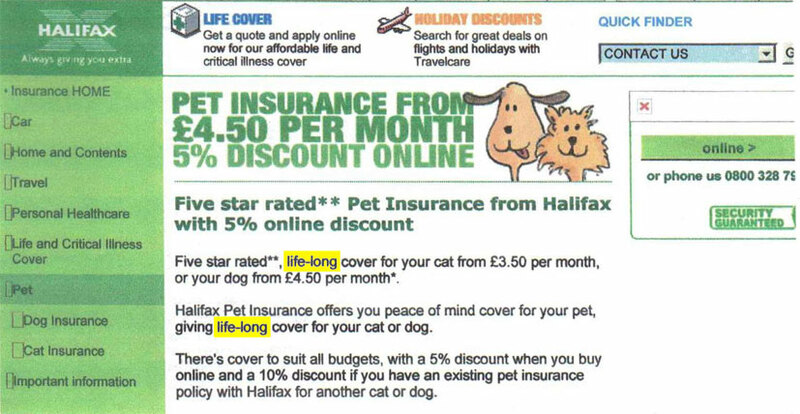 One reader forwarded us a screenshot of Halifax's former web promotion of its pet insurance policy which said cover was "life-long". Click on the thumbnail below to see it. We have used the original image but have highlighted the word life-long to make it easy to spot. 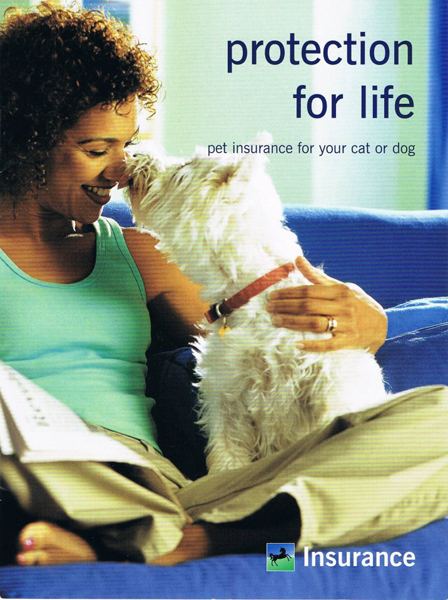 Marc Gander, co-founder of online forum the Consumer Action Group, forwarded us an image of Lloyds TSB promotional pet insurance material which described cover as "protection for life". Click the thumbnail below for the full image. Insurers will generally not cover a pre-existing condition, so owners whose pets have developed a problem since taking out insurance from Lloyds TSB or Halifax, both part of Lloyds Banking Group (Lloyds), are highly unlikely to be able to find cover for that ailment elsewhere. What's more, if treatment is ongoing as part of a claim, once the policy ends, customers will have to pay for the remainder of the treatment themselves. Lloyds says the policy terms and conditions made it clear the cover was not 'life-long' and that the term was only ever used in "general wording". Yet unless customers are experts in insurance law, the fact they saw the cover advertised as "life-long" may have made them believe their pets were indeed covered for life. Martin Lewis, MoneySavingExpert.com creator, says: "Lloyds is behaving disgracefully. To try to argue its terms didn't state this was a life-long policy, when as we've now proved, the front page of its brochure says 'protection for life' is disingenuous at best, morally bankrupt at worse. "Its PR rebuttals make this worse. While discussing this on ITV Daybreak last week — which ran a film about a woman in tears that she may need to put her pet down — its response may have seemed reasonable, simply saying life-long cover is not in the terms and conditions. "Frankly, who cares if it was in the small print? It was on the front of the brochure in a giant font. "Lloyds, come clean, you sold these policies as lifetime deals, we've got proof, screw the terms and conditions, play fair with your customers and live up to your sales pitch." A Lloyds spokeswoman says: "Following a detailed review, Lloyds Banking Group announced in September 2011 it would withdraw from the pet insurance market. We are sorry for any inconvenience this might cause. "Pet insurance policies were never referred to as 'life-long' policies in the terms and conditions. Cover for vets fees was provided up to a certain amount for the period of insurance, subject to cover remaining in force and premiums paid up to date." Lloyds says if customers are unhappy they should get in touch and it will speak to anyone about their concerns. While the bank hasn't confirmed it will offer compensation, some forum users have reported receiving money back. For now, search for the next best policy, and if you feel you have been misled or mis-sold, take up a complaint first with the bank and, if you get nowhere, then with the free Financial Ombudsman Service.